We're on a roll now. 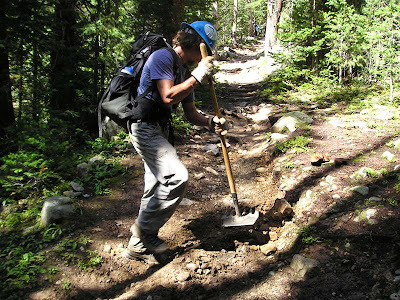 Spring trail maintenance is hard work, but hopefully we're beginning to see some results, and that should be encouraging. If you're just joining us, we've been doing a little annual maintenance on our spiritual trails here at Off the Beaten Path this week. And it's not too late to catch up or just to get started. We're hoping to get the narrow path we're on into good working order so we can make some real spiritual progress in the days to come. We want our trails to be rightfully challenging, but not because we've allowed danger to lurk in the bushes. And we want our trails to have ample water supplies, but not muddy pits. And Monday we simply made sure we were on the right trail - the narrow one where Jesus is calling the shots and blazing the way. Today we're checking for anything that might leave us standing still in our tracks and not moving forward. So heave ho! Let's go! Have I reached a plateau? Am I standing on a precipice where the path ahead of me looks scary and uncharted? Am I spending a lot of time looking back - either with pride and sweet memories or with regret and guilt? Have the trail blazes grown dim, causing me to struggle with the direction I should be going in? Have I grown so complacent, so lazy in my spiritual walk that I'm going nowhere? Do I no longer have a vision for what God has ahead for me because I've retired from the journey, stubbornly digging in my heels and refusing to go any further? Do I need to shake things up a little so I can move out and up? Have I let my guard down and let the weeds of complacency choke out the fruit I'm supposed to be bearing? Or has the oppressive presence of depression darkened my path? Is despair and hopelessness choking out the light from ahead? These things I remember, and I pour out my soul within me. Have I allowed the roots of bitterness, anger, unforgiveness, or resentment to grow up on my path. Are these negative emotions and dangerous attitudes impeding my progress forward. Are they causing me to stumble, therefore making me grow even angrier and more bitter? In fact, are these evil roots on my path even causing others to trip and stumble? that no root of bitterness springing up causes trouble, and by it many be defiled. just as God in Christ has also forgiven you. If little things are causing you to trip up and stumble on your path today, I hope you'll dig them up by the roots and give them to Jesus to dispose of. You might then allow Him to plant something good and healthy in the place of that which was uprooted - love, forgiveness, grace, mercy, compassion. Those all make lovely stepping stones for forward progress! Blessings to you! Just one more day of heavy labor and our spring maintenance is done!